Topics: the shape of speed. in the atmosphere and in space when objects move more rapidly than the speed of waves in their liquid or gas environments. These waves are usually called bow waves when they are produced in water, and bow shocks, or shock waves, in gases. Bow waves in water create drag force that slows down the object, and in the case of large ships, can pose a risk to smaller boats, especially in a harbor. Streamlined shapes, mimicking those found in nature, are designed to produce as small a bow wave as possible. An object moving through the air, or the rarified gas in the solar system, a galaxy or intergalactic space, of space, creates a series of pressure waves, or sound waves. When the object travels at the speed equal to or greater than the speed of sound in the gas, these waves merge into a 3-dimensional bow shock, or shock cone. The width of the bow wave or shock cone depends on the speed of the object. The faster the object travels, the narrower the cone becomes. Bow waves play a role in competitive swimming. The reflection of the bow wave off the side of the pool can slow down the swimmer in the outside lanes. 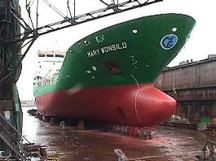 Many large ships are now designed with a bulbous bow, a protruding bulb at the front of the ship. The bulb modifies the water flow, and reduces the drag due to bow waves. 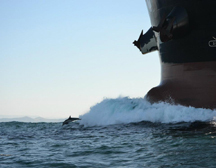 Dolphins are frequently seen "surfing" the bow waves of ships. The Mach number M of an object moving at a speed V through a gas with a sound speed Vs is defined as M = V/Vs. 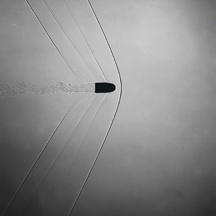 A shock wave is formed when M = 1, sometimes referred to as Mach 1, motion with M > 1 is called supersonic motion. For air at sea level at 20 degrees C, an object reaches Mach 1 at 1,225 km/hr (761 mph, or 1,116 feet/s). The shock wave forms a cone, with an opening angle A determined by the Mach number (sin A = 1/M) with higher Mach numbers producing cones with smaller opening angles. The .223 WSSM (Winchester Super Short Magnum) rifle can fire a bullet at 4600 feet/s, or Mach 4.1. The cracking noise from a bull whip is a small sonic boom created by supersonic motion of the end of the whip. Meteors are traveling at highly supersonic speeds when they enter the atmosphere, and large meteors can create audible sonic booms. With so many objects out there moving so fast, it is not surprising that bow shocks are common in the cosmos. In general, cosmic bow shocks can be difficult to detect because they are relatively thin, and are usually found in an environment where a lot is happening. In spite of this, astronomers have used the Chandra, Hubble and Spitzer telescopes to collect some spectacular examples of bow shocks. The bow shocks are like weather vanes: they can reveal which way the wind is blowing. They can also tell how strong the wind is. Image: X-ray: NASA/CXC/CfA/M.Markevitch et al. ; Optical: NASA/STScI; Magellan/U.Arizona/D.Clowe et al. ; Lensing Map: NASA/STScI; ESO WFI; Magellan/U.Arizona/D.Clowe et al. The material in the fast wind from the star LL Ori is colliding with slow-moving gas evaporating away from the center of the Orion Nebula, creating a bow shock. A second, fainter bow shock can be seen in the upper right-hand corner of the Hubble image. The rapidly rotating neutron star, a.k.a. pulsar B1957+20,has creates a cocoon of high-energy particles around the neutron star, and a visible bow shock has formed around the pulsar as it moves at a supersonic speed through the galaxy. 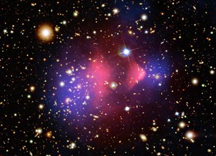 The Mach angle of the bow shock in the Bullet Cluster allowed astronomers to estimate that the subcluster was plowing through the 100 million degree Celsius gas in the main cluster at a speed of about 6 million miles per hour.